On our trip to North Carolina a few years ago, John and I visited a fabulous wine store and stocked up on some great wines. We recently opened a Bordeaux from Chateau Les Ormes de Pez. Our meal consisted of a blue cheese and crab crusted filet mignon, roasted potatoes and beets. The wine was elegant and smooth on the finish, but definitely brought forward a tonne of fruit and some spiciness on the nose and it still had enough structure to stand up to the blue cheese. Overall, this was definitely a win. Another great pairing would be a veal sandwhich with the works. 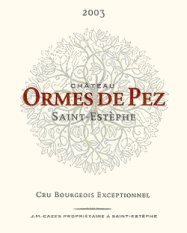 Chateau Les Ormes de Pez is located in St Estephe which is the northernmost Haute Medoc appelation. Wines from St Estephe tend to be more austere in youth, but mellow into silken wines if you cellar them for long enough. We held on to the wine for 3 years and it was fantastic, but it could have become even more complex if we held onto it for a couple more years; this is definitely a learning experience; buy multiples if it is a good wine.